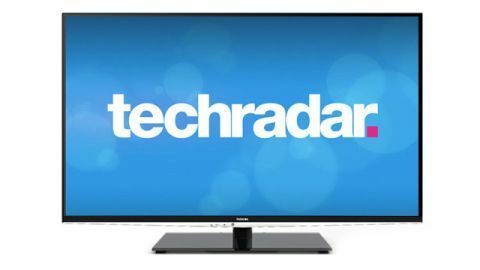 The Toshiba 55VL963 is an internet-enabled connected LED TV, with catwalk looks and inexpensive Passive 3D technology. It has much in common with Toshiba's TL9 series, which uses Full HD Active Shutter 3D, and doesn't stretch as wide as 55-inches. This 55-inch range-topping telly, which costs £1,399 (about $2,187), is joined by the 42-inch 42VL963 and the 47-inch 47VL963, priced at £849 (about $1,328) and £999 (about $1,562) respectively. The televisions are identical, bar the different screen sizes, of course. Feature-wise, the Toshiba 55VL963 hits all the hot buttons. It connects to a streaming net portal, Toshiba Places, and sports dual Freeview HD and satellite DVB-S2 tuners. The latter can be used with any Sky dish to give a wider channels selection than terrestrial Freeview HD provides. Toshiba's proprietary Resolution+ image upscaler is on hand to improve standard definition sources, and the set will also depth convert 2D into faux 3D. The TV's good looks owe much to the designer elves at Jacob Jensen. A single sheet of glass extends edge-to-edge, revealing a slim bezel beneath. The panel has a metal trim, for a stark contemporary look. The downside is that the glass is very reflective, making it all too easy to be distracted by room furnishings and the shenanigans of the pet cat/dog/Vietnamese pot-bellied pig. Supplied is a fat but comfortable IR remote controller. Toshiba's VL Series TV screens are traditionally positioned just beneath its high-end offerings, not that you'll feel short changed by this set's specification. The Toshiba 55VL963 is a seriously well-equipped television. For many, the top line feature attraction will be the net connected portal, known as Toshiba Places. Unlike competing IPTV walled-gardens, Places has a somewhat personal touch, playing up social media apps such as Facebook, Twitter and Flickr. Unfortunately, you can't access your normal accounts directly via the TV, so you have to create a dedicated Toshiba account first. This makes usability a bit clunky, since different family members will need to log in and out of different Toshiba accounts to access their stuff. Given that most users will have a multitude of devices able to do a better job, this concept is clearly on a hiding to nothing. Even worse, Places on the Toshiba 55VL963 goes out of its way to be unintuitive. Rather than offer as wide a selection of streaming TV content as possible, it divides them up and hides them behind different doors, for no good reason: TV Places, Video Places and Music Places all contain streaming services, arbitrarily cordoned off. Thankfully, the set's USB media player is more accommodating. It straightforwardly handles a wide variety of files and containers, including AVI, MKV, WMV, MPEG, MOV and VOB video, as well as MP3, WMA, WAV and AAC audio. However, file compatibility ends at the USB flash drive. The TV's network media player is a complete write off; the brand's not even trying here. Connectivity is good enough. There are three rear-facing HDMIs, one of which is ARC (Audio Return Channel) compliant, plus a fourth is side-mounted. Other inputs include Scart, component video, phono AV, PC VGA, and two side-mounted USBs. One USB port can be assigned to record shows to an external drive (with up to eight drives registered to the TV). There's also Ethernet, a digital optical audio out and a CI slot. Don't like the heavy-duty glass stand supplied as standard? The Toshiba 55VL963 is compatible with a standard VESA 400x400 wall mount. Intriguingly, the TV also offers WiDi compatibility (although we had to update the firmware by USB to get it). This enables local wireless connection of a WiDi-enabled laptop, without a need to bother your LAN. At least it would if the set was Wi-Fi enabled, which it isn't. For that, you'll need a dedicated Toshiba Wi-Fi dongle. Only then can you unlock the WiDi feature.